Home Environmentalism What is business for? “Companies have an important role to play in society, and L’Oréal intends to make a significant contribution” said Jean-Paul Agon, chairman and CEO of L’Oréal, in last April (quoted in Canada’s Maclean’s magazine’s annual survey of the top ‘socially responsible corporations’). L’Oréal’s ‘socially responsible’ initiatives include ‘sustainable sourcing’ (using renewable raw materials) and creating thousands of jobs for people from underprivileged communities. Think about it for a moment: what is the role of business in society? To promote environmental and social initiatives—or to produce and trade material values to meet demand for them? Although the vast majority of large corporations, like those featured in Maclean’s ranking (e.g., PepsiCo, Kellog, Goldcorp, Intel, GE), have embraced the former, I argue for the latter. I am with Milton Friedman who more than 40 years ago wrote that “the social responsibility of business is to maximize profits”—because that is best from the perspective of human well-being. If companies focus on what they know best, producing and trading material values to maximize profits, an increasing range of products and services will be available to us for lowest possible price and highest possible quality, making our lives better. And because companies create material values for which we are willing to pay more than their cost, they (their shareholders) also benefit, through dividends and increased value of their shares. This win-win situation extends beyond customers and shareholders to all those with whom companies trade: employees, suppliers and creditors. Even competitors benefit, because competition pushes them to innovate and thus improve their own profitability. When companies adopt long-term profitability as their goal and guiding standard, not only do they work to lower their costs and improve their products and services. They will also seek to act morally, by refraining from initiating physical force or fraud against anyone. Doing otherwise would violate the individual rights of others, such as investors, customers, employees, and creditors—and jeopardize the companies’ sustained profitability. When long-term profit maximization is such a win-win for everybody, why have so many companies, such as L’Oréal and others, compromised it to embrace ‘corporate social responsibility’ as their major role and contribution? In a recent Financial Post op-ed, Patrick Luciani suggests that “corporations are victims of Stockholm Syndrome and now support the very groups that have taken them hostage,” referring to the various NGOs and politicians who continually attack business for putting ‘profits before people,’ for not contributing their ‘fair share’ or for allegedly causing all kinds problems, from poverty to pollution. Ayn Rand called corporations’ appeasement of their critics “the sanction of the victim,” where the victims appease their critics, hoping to win their approval. Luciani and Rand have it right. Corporations (the executives that steer them) have observed that social and environmental causes, from reducing inequality to cutting CO2 emissions, are popular among consumers. Corporations are hoping to win consumers over, while placating the critics, by donating money to these popular causes. Such appeasement is wrong, for two reasons. First, as Milton Friedman pointed out, the money is not the corporate executives’ to spend on any cause, except to maximize profits. The money belongs to the shareholders, and the decision as to how to spend or invest it is theirs. Second, appeasement is always futile. Attacks will continue and escalate, and no matter how much money companies give to the enemies of business and how much they verbally appease them, it is never enough. 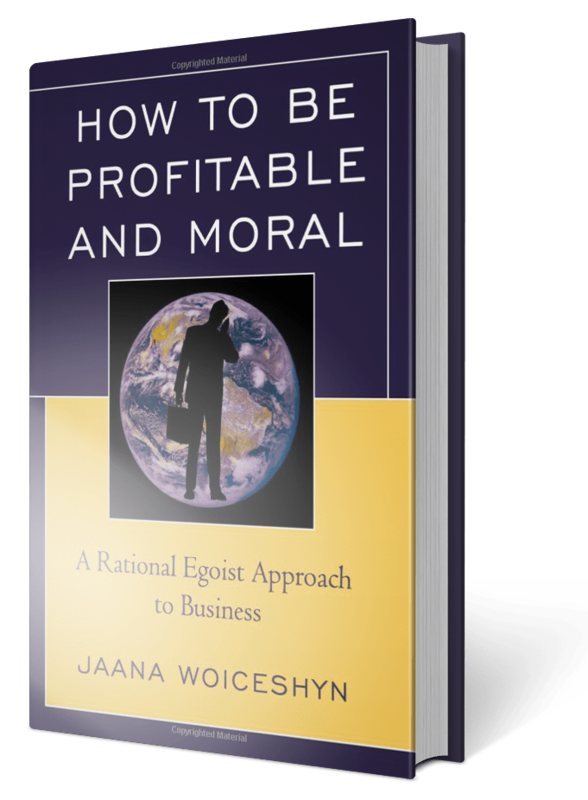 Business is for producing and trading material values, driven by the profit motive. Companies should leave the pursuit of all other causes for individuals who choose to spend their own money doing so. And instead of appeasing their attackers financially and verbally, they should adopt the moral high ground and defend business and profit maximization for enhancing human survival and flourishing.